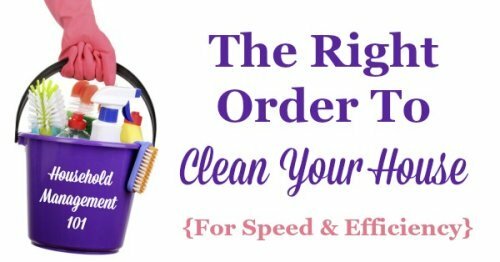 What Order Should You Clean In? Have you ever wondered how to clean your house more quickly and efficiently? Are you ready to clean your house but can't figure out what area to tackle first? Does it really matter? The answer to this question is, maybe yes, maybe no. If you haven't tackled house cleaning for a while just making any kind of dent will probably be just fine. Don't get too bogged down on the order, just hit the priority areas. 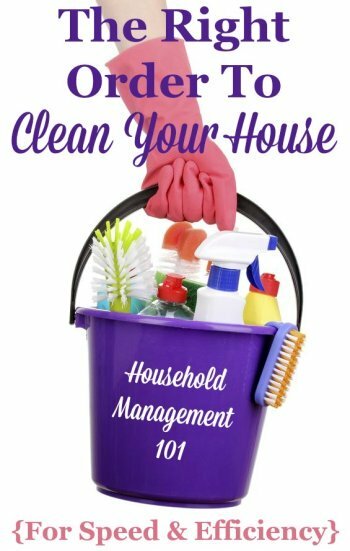 If, however, you follow a house cleaning schedule, as I have suggested, then creating a set order on how to clean your house will save you time and energy. Have you ever gotten more out than you can put away in the time period allowed for your task? Something similar can happen with house cleaning if you are not careful, but how you clean your house and order your tasks can make all the difference. Once you get an area clean you don't want to disturb it again while cleaning other areas so planning and tackling tasks in a certain order helps. There is no one size fits all solution to how to order cleaning tasks in your home, because each home is different in layout and individual tastes of what needs to be cleaned first. However, once you settle on some type of order you will find that it saves you time and energy because you get into a sort of state of flow, and can go from task to task without having to think about what you will do next. 1. Start with cleaning and other chores that require cleaners to sit, or those that can be going while you are doing something else. For example, starting the dishwasher, running a load of laundry, or putting toilet cleaner in the toilet bowl should all be started at the beginning of the time devoted to cleaning your house because they can be working while you do other things. 2. Work from the top down. You should start cleaning upstairs, and then work your way downstairs. I find that if I start at the top somehow it is easier to go down, but to lug the vacuum up the stairs is too much after I've started. Work with gravity and go from top to bottom. 3. Go from inside the house to outside the house. Similarly, I find starting on the inside of the home and then going to the exterior is more motivating to me, like I am pushing the dirt out of our home, literally. For each room it will be much easier to actually get to the cleaning process if you don't have to deal with a bunch of junk in your way. Take the time to put things away to make it easier on yourself. This is especially important for vacuuming, because you will kill your back trying to pick up while you are vacuuming. 5. Dust before cleaning floors. When you dust each room you will most likely get some dust on the floor. 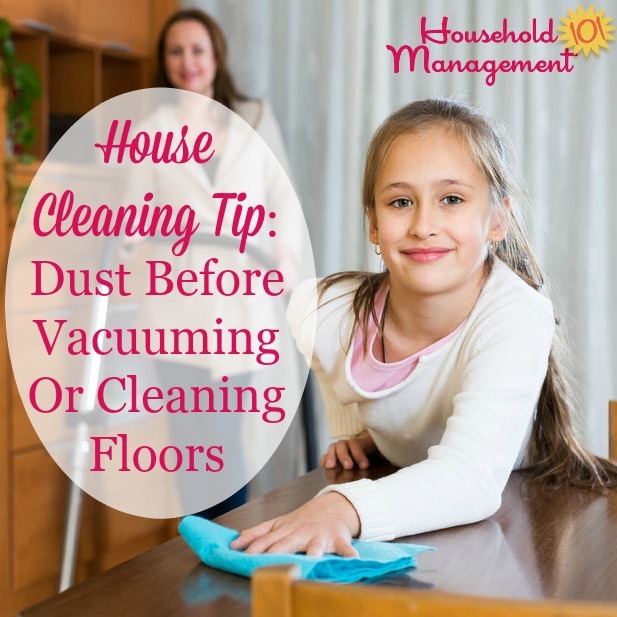 You don't want to have to vacuum again to get the new dust off the carpet or create mud from the dust settling onto the still freshly mopped (and wet) floor. Therefore, dust first, then proceed with other tasks in the room.